This painting is part of a body of work observing the elaborate and subtle layers people use in social interaction. The two people in this painting are sharing a moment in space and time. People, it seems to me, find community in their like-mindedness and struggle to see outside these communities. 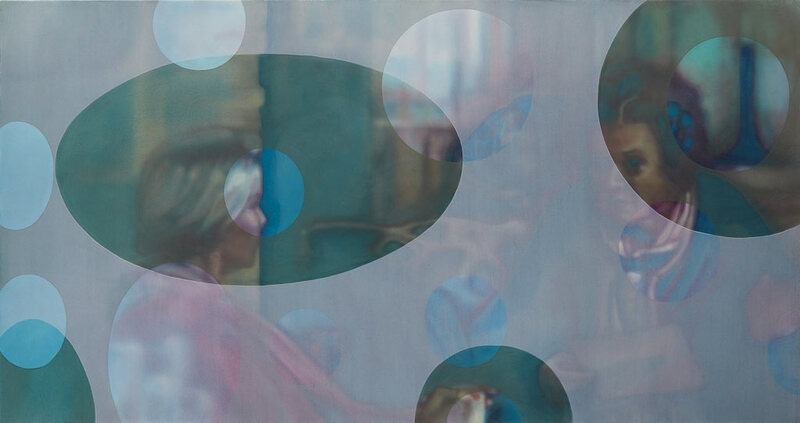 This painting seeks to represent two ordinary people sharing a conversation. The circles are like portholes, giving access to ways through the work and emphasising the drama of the space between the two women. Layers and masking are recurring motives throughout my work.